This is the easiest recipe ever!!!! A big shout out and all the credit goes to Rosie from The Londoner, who put this recipe up on her blog very recently. I'm not a great baker and even I thought this would be easy to do. However, I currently only have the use of one arm and being very impatient, you know, like wanting to make them yesterday, I enlisted the help of Mr C who was actually more than willing! He does like a bit of baking. Ours don't look as pretty as Rosie's, from a photogenic point of view but if you do end up making these (and you should) then I wouldn't worry too much about prettiness as they're scoffed as soon as they're out of the oven! 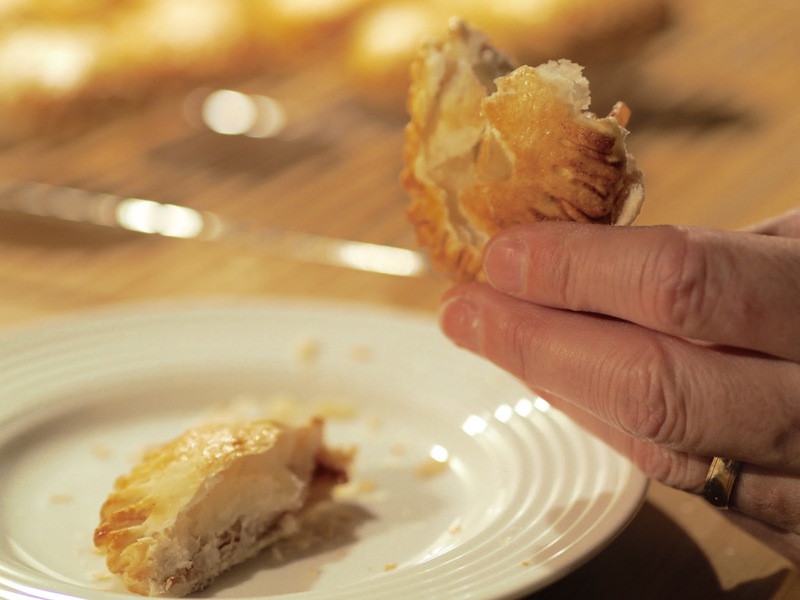 Unroll your pastry and cut out as many circular discs as you can. Do this to both sheets making sure you have equal amounts. To be honest our cookie cutter was a bit too small and realised this once we'd made them as we couldn't get much filling in them so next time we'll go slightly bigger, maybe use a glass or cup as a template. Next, peel your apple and cut into tiny cubes. Put into a bowl and squeeze your lemon juice over it, then add the sugar and cinnamon. Give it a good stir until it's all coated and looks like this. It smells so amazing and all Christmassy it's ridiculous! Line a baking tray and pop your discs on it. Top with your apple mix leaving a good border around the edge. Now add your caramel sauce. You can use caramel sweets chopped up but the sauce is easier. Rosie used plain caramel sauce and then added a FEW flakes of rock salt on top, if your using this method be sparing as you don't want to overdo the salt! We bought a jar of caramel sauce that was already salted (that was actually all we could get on Sunday!) so we skipped the step of adding the salt ourselves. Dollop a good amount of the caramel sauce on top of your apples. Top with the other pastry discs. Close and seal the edges with a fork and poke a few holes in the top too. Brush the tops with your beaten egg and then sprinkle with caster sugar. They then come out looking like this, all nice and golden. Leave them for a little while to cool on a wire rack, but not for too long, they're best eaten still slightly hot or warm inside. You need to take care though not to burn yourself with that hot gooey caramel sauce. Like I did. Too eager. 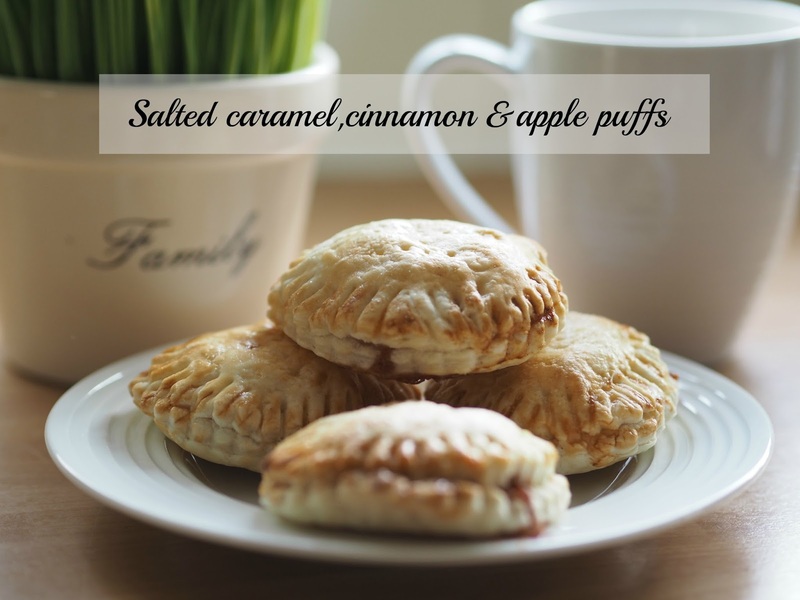 Quite simply these little pockets filled with the perfect combination of cinnamon. apple and caramel are deliciously mouthwatering and I warn you, one will not be enough. I may or may not have eaten three as soon as they were cool enough!! Ahem....... I wasn't the only one though was I Mr C and Emily? Needless to say they were devoured in no time. Mr C has got to make another batch (with a little more apple mixture in there next time) as they'll go down a treat when I'm decorating our tree and getting into the Christmas spirit this weekend. We need a batch for Christmas time too as these beat any shop bought apple pies hands down! Do you enjoy baking? Do you fancy having a go at these? 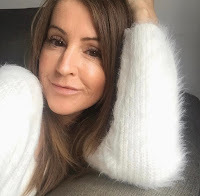 Don't forget to follow along on Bloglovin so you don't miss a post. I was drawn to the post from the sight of those puffs! They look so delicious. I do like baking but I have yet to try baking pastry. I mainly make cakes and biscuits. These look amazing! I think I will give these a go closer to Christmas - thank you for sharing!